This text comes packaged with an access kit for the new easy-to-use format of MyEconLab, which requires no set-up by the professor. With this, students can access practice problems for each chapter in the book, graphing questions, learning resources, and live tutoring. Professors who plan to use advanced course management online should order the book with MyEconLab in CourseCompass. View `Alternate Versions' of this book on the web catalog page, or contact your local representative for details. 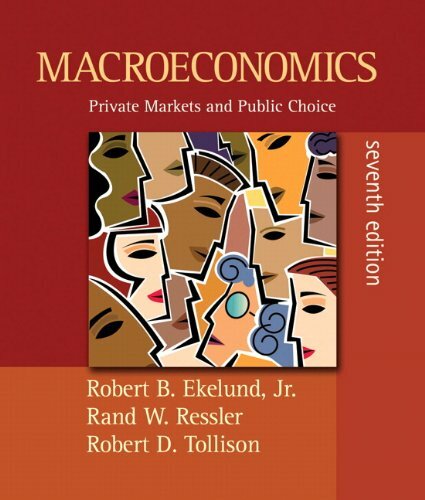 Macroeconomics: Private Markets and Public Choice emphasizes that economics is, at its base, about our society's well-being and our individual happiness in all forms, not just profit. The authors teach students to apply economic concepts not only to key policy decisions like taxes, inflation, and free trade, but also to personal decisions such as household finance, marriage, and career choices. The Seventh Edition is enhanced by MyEconLab, the online homework system featuring automatically graded graphing problems and proven tutorial tools. Access to MyEconLab comes with every new textbook at no additional cost to the student.